Tasteful flair is somewhat necessary in selling cars. A few automotive designers could do with a decent dose of Alfa Romeo’s talent in car design. A classy car from all angles, the 147 has plenty of talent to burn and is regarded by many as the best looking hatchback in the world. A number of engine variants are available in the Alfa Romeo 147 line-up. The base models offer exceptional sparkle and economy, while the high-end models offer very powerful performance and exceptional roadholding. So where does the Alfa Romeo 147 5dr Diesel sit in the 147 range? Let’s take a look. Open the door and sit right down, and very quickly one notes the unique sporty interior design that the Alfa Romeo 147 1.9 JTD offers. The seats are exceptionally comfortable, and in typical Alfa fashion, they are supportive and figure-hugging. The characteristic round air-flow dials and inset instrumentation are elegant and totally Alfa. With dual-zone climate controlled air-conditioning, this is the place to spend some time on a hot muggy Australian day. There are plenty of useful luxuries that make driving the Alfa Romeo 147 1.9 JTD a pleasure. 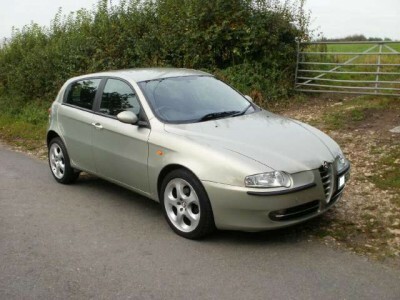 Cruise control is an essential item of the sprightly Alfa Romeo 147 1.9 JTD package. So, too, is the 8-speaker CD audio system that has the ability to create an incredibly crisp sound. The dark interior boasts a leather sports steering wheel and black sports cloth seating. Electric windows are standard, and a fun feature is the outside temperature sensor which has a read out display on the dash. An onboard trip computer enables the driver to keep well up with the play on the journey’s proceedings. It really isn’t hard to get comfortable behind the steering wheel of a Alfa Romeo 147 1.9 JTD, as the driver’s seat is every-which-way adjustable, and the steering wheel has the ability to go in and out while also being able to be adjustable up and down. Room in the rear is credible, especially for two full sized adults – although you can fit three adults across the back seat. A solidly built small hatch, the Alfa Romeo 147 1.9 JTD has a number of excellent safety features. Dual front airbags, side airbags and head-protecting side curtains are standard equipment. Pretensioners are fitted to the front seat belts to reduce slack in the event of a crash. These seat belts also have load limiters. Notably excellent are the antilock brakes, which are very good at hauling the 147 in from a high speed. The crisp roadholding is connected up to an excellent Electronic Brakeforce Distribution (EBD), Anti-Slip Regulation Traction Control and Vehicle Dynamic Control (VDC) system. Each Alfa Romeo model comes with a special fire prevention system (FPS). For the family minded folk reading this article, you will be pleased to note that there are children’s safety locks on the rear doors. We appreciated these on our car when we had our two toddlers. In the dark, the electric headlight adjustment works wonders when there is a heavy load onboard. And, if you get back late from a night out with friends, it’s nice to know you have the security of Alfa’s “Follow me home” lighting. Peppy engine performance makes the top class 1.9 litre diesel engine the best buy in the 147 line-up. The Alfa Romeo 147 1.9 JTD has a very useful 305 Nm of torque at the ready, while the 0-100 km/h time is kept under nine seconds as the car can be slung through the slick six-speed manual transmission effortlessly. A top speed of 208 km/h keeps the Alfa Romeo 147 1.9 JTD a step ahead of the competition too. For a tight and comfortable drive, it doesn’t get much better than in the very fuel efficient Alfa Romeo 147 1.9 JTD. For any more information on the Alfa Romeo 147 1.9 JTD, or for that matter any other new car, contact one of our friendly consultants on 1300 303 181. If you’d like some fleet discount pricing (yes even for private buyers! ), we can submit vehicle quote requests out to our national network of Alfa Romeo dealers and come back with pricing within 24 hours. Private Fleet – car buying made easy!